Store International Cross Border Pipeline Arrangement. : What Would A Single Regulatory Framework Look Like? Cross Border Pipeline Arrangement. : What Would A Single Regulatory Framework Look Like? the effect of new national oil and gas legislation in any country partner. In the final analysis the author proposes the creation of an autonomous unifying mechanism in the form of an agency with strong regime credentials. He shows how such a body would reduce the level of intervention by government or other parties in the pipeline regime, without interfering in the sovereignty of any particular country. He clearly outlines the process through which the agency would use its enforcement capabilities. As more and more pipelines are being built all over the world, and as the nature of relations among energy exporting, importing, and transit countries becomes ever more critical, this book comes as a fresh and cogent approach to this very important subject. It will be welcomed by all interested parties in oil and gas industry and regulation, as well as by academics and officials in international relations. Chapter 2 The Analytical Framework. 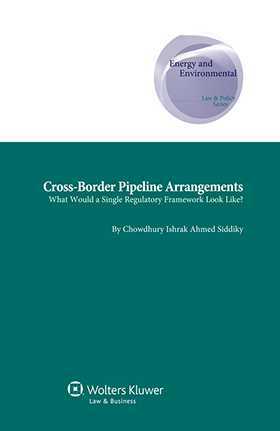 Chapter 3 The Characteristics of Cross-Border Pipelines. Chapter 5 Moderately Strong Regimes. Chapter 6 The Weak Regimes. Chapter 7 The Existing Regulatory and Enforcement Mechanisms. Chapter 8 Towards a New Framework for Cross-Border Pipelines: The International Pipeline Agency (IPA).